What: Gorewad Monsters, some of the latest and most awesome examples of custom creations to come from members of the toy collecting community. These come as a set of three 1"-1.25" rubber figures and were sculpted by Jimmy "Ironmask" Rommel and cast by Eric Nilla. I have to say, both did a fantastic job. These toys sit comfortably next to some of the mini figure greats such as Garbage Pail Kids Cheap Toys, Mini Boglins and Monster in My Pocket, but have an identity all their own with their concept of bizarre, twisted gross-out animals/mutants. There's "HippoROTamus," a messed-up hippo guy who looks like he wants to eat your face for lunch, "Diet Hell Turtle," a pissed-looking turtle who's grasping a large heart (his own or perhaps one of his victims'?) and "Hammerguts," a shark-man so fierce and maniacal he's decided to rip open his chest and spill his own guts. 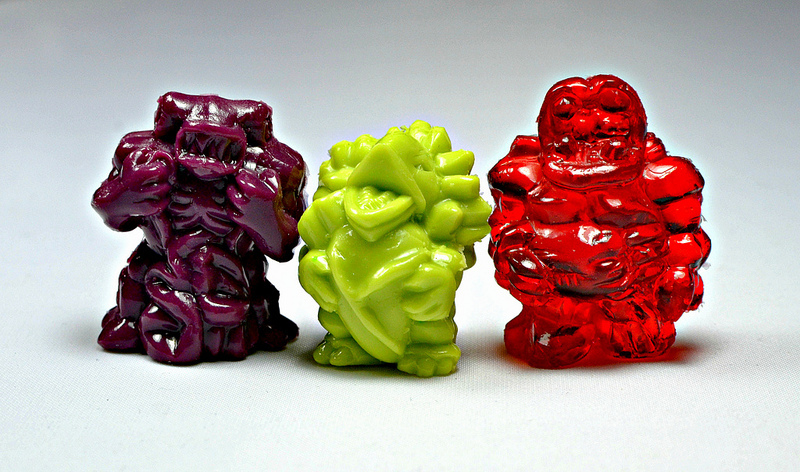 The name "Gorewad Monsters" is perfect, because they really are little rubber wads of gore! There are many things I love about these figures. First, they have an excellent twisted sense of humor about them. Their gross-out fun reminds me of why I've always loved Garbage Pail Kids and similar series. Second, the detail is impressive, especially considering they're so tiny in size. For example, the back of Mr. Hell Turtle was sculpted to look like it could be a completely different character when you turn the figure around! I'm also a big fan of the material these are made of--it's really rubbery yet firm, sort of like a superball (although I'm afraid to try bouncing them for fear they'll get lost). These are also sold packaged as a set of three in random colors, and the element of surprise makes it extra fun to tear open the package when it arrives in your mailbox. 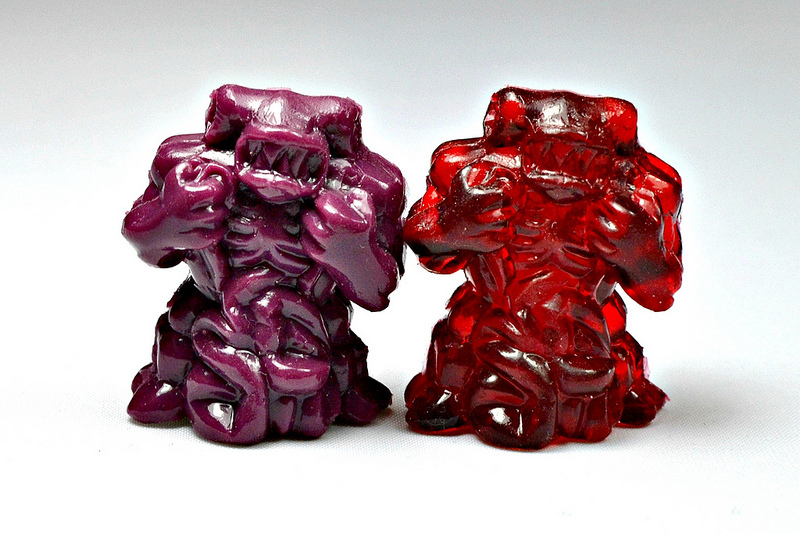 I got three great colors: a clear red that looks like cherry hard candy, a pale green that looks like a chewed lump of spearmint gum (appropriate for the Gorewad gang, I think) and a snazzy plum purple. There seems to be many colors available, including an electric pink variety I'd love to get one of next, which you can see an example of over at the MinifiguresXD blog. In my opinion, the Gorewads are must-have mini figures! 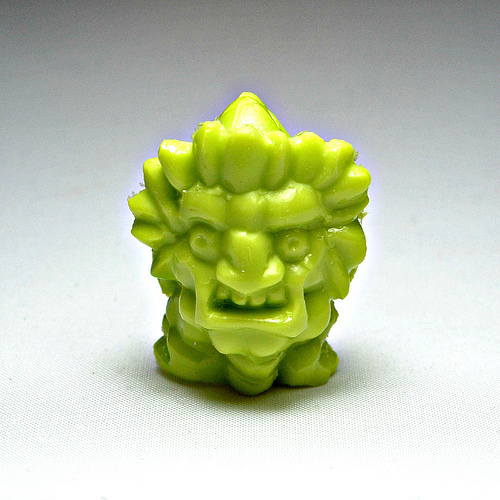 According to Ironmask's blog there are already additional sculpts in the works, and I can't wait. When: These guys just went on sale in July 2012. Where: You can order a set of three online right here. They are also currently being sold at Laughing Ogre comics shop in Columbus, OH, if you happen to be near there. Who: Sculpted by Jimmy Rommel and cast by Eric Nilla.